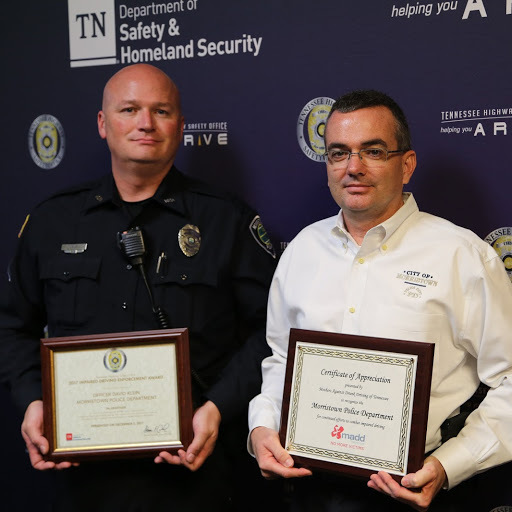 Earlier this month, two officers of the Morristown Police Department (MPD) were given awards at the Tennessee Highway Safety Office’s (THSO) Awards Ceremony in Greeneville, Tennessee. Officer David Klein was presented with Mothers Against Drunk Driving (MADD) DUI Enforcement Officer of the Year and Sergeant Brian Sulfridge was presented with THSO Officer of the Year. Officer Klein was nominated by MPD Major Chris Wisecarver and Sergeant Brian Sulfridge for his efforts in keeping our roadways safer by combating drunk and impaired driving. Officer Klein has the most DUI arrests for the Morristown Police Department this year. Major Wisecarver stated, “One aspect that is reinforced in DUI arrests is that the foremost priority of the DUI arrest is saving a life whether it be the driver who was arrested or another motorist.” According to the nomination, Officer Klein’s successful prosecution of DUI offenders is aided by his thoroughness of the investigation in its totality from arrest to conviction. Officer Klein was presented the award by Steve Dillard, the East Tennessee Law Enforcement Liaison for the Tennessee Highway Safety Office. MADD representatives were also present. Officer Klein has served the citizens of Morristown for 13 years; he is assigned to the Patrol Division. 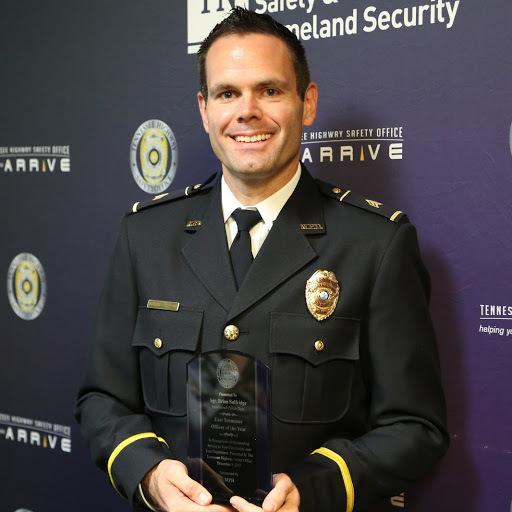 Sergeant Sulfridge was nominated for the Tennessee Highway Safety Office’s Officer of the Year Award for his dedication to traffic safety and leading the department in traffic enforcement efforts, according to Major Chris Wisecarver. In addition to his first-line supervisor duties, Sergeant Sulfridge participates in DUI saturation patrol efforts and helps with the department’s Traffic Crash reporting and Records Management systems. Sergeant Sulfridge, a 15 year veteran of the MPD, “leads by example and works with officers daily to ensure safety on our roadways” Major Wisecarver stated. The Morristown Police Department was also recognized by Mothers Against Drunk Driving for the continued efforts to combat impaired driving. Operations Major Chris Wisecarver was there to receive the award on behalf of the department.